In the day-to-day work life managing a variety of archives here in the NYC metro area, I recognize how easily I can forget the extraordinary meaning of this work for that occasional end-user who finds him/herself on a mission with passionate meaning. This was the summer my husband and I traveled to Sicily, with an intention to spend time in the homeland of both his parents – a trip that was long in the planning, and short in its hope to locate lost relatives during our brief stay. We were going on very little. 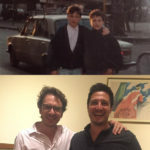 A cell phone image texted to us from a Staten Island nephew – a faded image of a house that looked like every other house in Floridia and an image of two small boys standing arm in arm, from the late 1980s. How could this possibly mean anything? For the most part, when I am elbows-deep in unprocessed papers, hoisting 30+ pound cubic boxes from there to here, tending to errant paper cuts or just contemplating a stray piece of correspondence, I am most often lost in the world of its creator. Who exactly was this person? Institution? Family? And so that invisible conversation begins, and continues on until I finish with the very last box. Less often, until now I suppose, am I pondering the variety of beings who will eventually sit before these meticulously arranged and described boxes, with their own stories laid out like a long shadow at a day’s end. This summer we found ourselves in the homeland of my husband’s parents. Floridia, a town situated on the southern coast of Sicily, just outside of Siracusa. 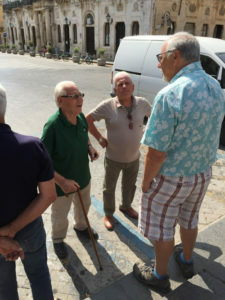 And thanks to a local tour guide with a great heart, we were gently nudged towards a vibrant posse of aging Italian men holding court in the Piazza de Popolo. Note to self: when searching for answers, start with the elders. This eventually led us into the bowels of the Floridia Municipal Archives, conveniently located directly across the street from the piazza. 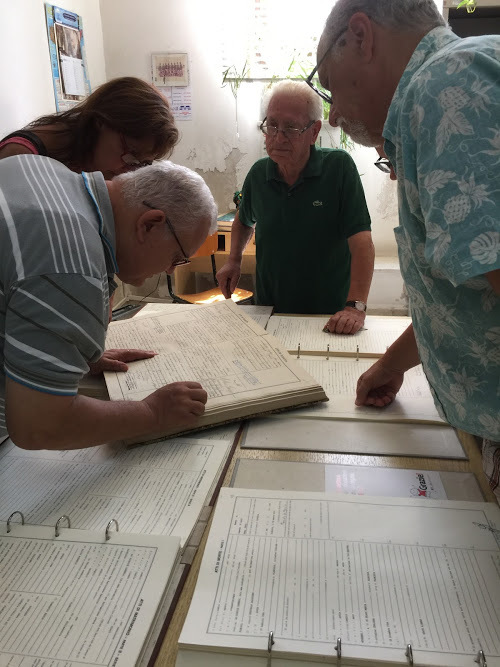 After not-so-patiently waiting for a young woman to finish mopping the marble floor of the archives, we were motioned to enter and began a swift and lively back and forth with the archivist, staff members, and a priest from the local church, half in English and half in Italian. Up went a volley of family and street names, dates of births, deaths and journeys to the US. 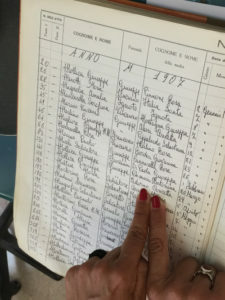 The ledger books came out, and fingers slid down rows and rows of beautifully handwritten text. Eventually, facts began lifting up from each page and were murmured like one long Italian prayer. A few small puzzle pieces began to fall into place. 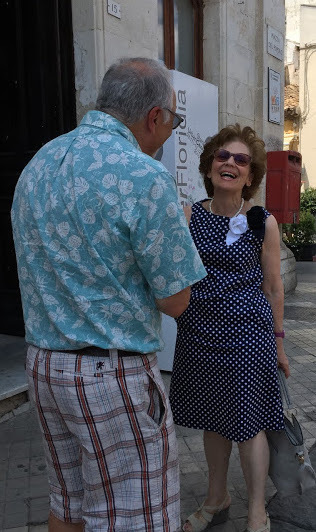 Eventually, thanks to a Floridia town archivist, a gentleman from the piazza with a cane and a cellphone who joined our efforts, and our magnificent tour guide Valeria DiMauro, family members were indeed reunited, right there in front of the town hall, in a matter of just a few hours. All recognized, it was meant to be. Now, settled back into my routine here state side, I find myself thinking about those solitary archivists, making their marks throughout the decades, with pencils and now pixels – perhaps not often thinking much about how far reaching their work will play out centuries later. On our last night in Rome, alongside of that vast scrum of selfie stick wielding tourists, we tossed our coins into Trevi Fountain. I silently gave a shout out of thanks to all the passionate ones who help others connect the dots of one’s own personal history. Lunga storia di famiglia dal vivo! And, long live the archivist. What a stunning, heart warming story so eloquently shared. Thank you! What a wonderful story of the dedication and commitment of people practicing your own profession illuminating your life from another era. Like a message across time.